Envision complete well-being. What would you require in order to achieve it—more time in a day? An increased income? A lighter workload? Unfortunately, what we think will put us on the path to happiness and overall wellness is not often what we need, nor is it attainable. 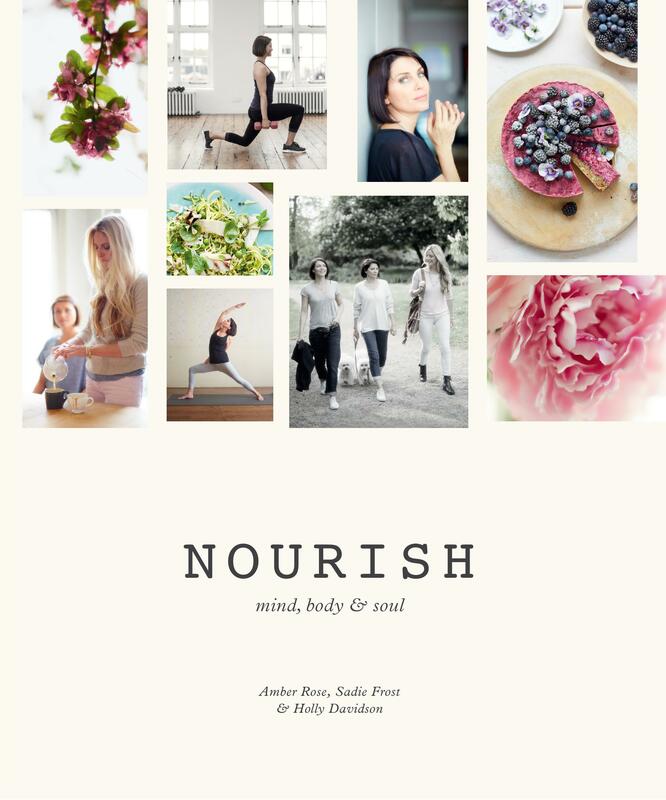 In Nourish: Mind, Body & Soul, Amber Rose, Sadie Frost and Holly Davidson outline a balanced set of steps to assist you in optimizing your health and contentment, no matter what burdens the day-to-day grind may place on your shoulders. Nourish is divided into three main sections, each penned by one of the book’s authors. Each expert brings to the table her own knowledge and passion for a different facet of wellness. Amber lays the foundation for a healthful life with delicious, seasonal meals chock-full of the nutrients your body craves. To pamper the mind, Sadie shares meditation and yoga techniques—both targeted to specific moods and for everyday mental rejuvenation—as well as recipes for natural beauty products and remedies to soothe. Holly provides accessible tips for incorporating exercise into any daily routine, as well as an inspiring, four-week workout regimen to condition the body. Equally as stunning as it is stirring, Nourish is beautifully illustrated throughout with exquisite photographs by acclaimed photographer David Loftus. With mindfulness practice becoming the mainstream in the pursuit of inner peace and peak mental and physical wellness, Nourish successfully paves the way to bettering mind, body and soul for the best life possible. The “Fit Woman” chapter begins by addressing perspective, grounding the reader in the right mindset to flourish in the exercises that follow. The “Body” section also provides simple and informative benefits to performing each routine. Increases your metabolism and basal metabolic rate (BMR) so your body burns more calories each day. Reduces the chance of osteoporosis by increasing bone density. Tones and sculpts your body and gives it definition by increasing muscle tissue. Releases the happy hormone so your mood and energy levels increase, which in turn reduces anxiety and depression. Keeps you young—it’s the most effective anti-aging activity. Reduces many lifestyle-related diseases and chronic illnesses. Increases quality of life and overall well-being. It’s not all work and no play, however—Nourish’s selection of recipes includes nutritious and satisfying dishes for every meal, featuring indulgent desserts as well as Amber’s “Toolbox”—a selection of DIY oils, creams, syrups, sauces and other pantry staples to suit all tastes. For a sample of the myriad soul-satisfying offerings in this inspiring title, check out Amber Rose’s Spiced Chocolate & Sweet Potato Brownies straight from Nourish’s pages.